Do you have a NOAAPort Dish? Is it Registered? Desperately Seeking Volunteers and Door Prizes! Compliments. If you read all the way through this, I will pay you compliments! If you stare into the mirror for a while, you’ll notice things that you have never seen before. You’ll definitely notice that you’ve aged and changed. That’s not a bad thing if you account for it in your limits and in your strengths. The National Weather Association has also aged and changed. We are wiser and intend to have a long, healthy life. That’s why we follow best practices for organizational, financial, and legal security. Expect to see some of these changes in our updated Bylaws and amended Articles of Incorporation. They will be different, but different is not bad when it has a good reason behind it. Without change, there is no progress. 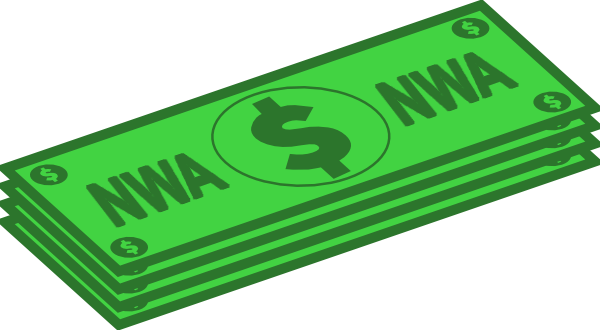 Many NWA members may wonder what the staff and Council do behind the scenes. 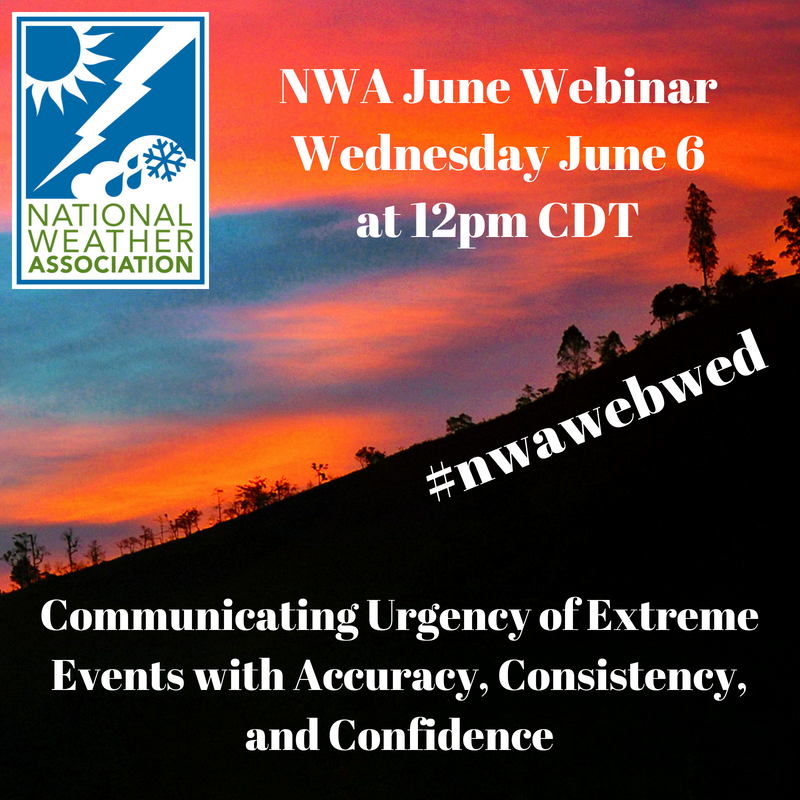 You need to know your National Weather Association is working hard to ensure our organization has a positive and robust future, continuing our mission of supporting operational meteorologists. While we are a non-profit association—we operate as a business. The NWA staff handles all the business of maintaining an organization: office spaces, mailings, memberships, communications, conference logistics, bills, accounting, and fulfilling tax and legal requirements. Committees work with the executive staff to support things like social media, marketing, seals of approval, training webinars, and diversity just to name a few. The annual conference is formatted and planned by a steering committee with input from our varied committees and guidance from our Council and NWA staff. It’s a flurry of activity that our active members volunteer to make it a breeze. The NWA Council oversees the mission and vision for who we are, what we want to be, and where we are going. In April, we met for training on how to be a more effective governing board and strategic planning. Without a plan and goals, we would float aimlessly. Did you know our NWA structure and history is on our website? Look through it. Do you have suggestions for how we can better serve your professional needs? Do you have questions about why NWA does or doesn’t do certain things? You can email me [email protected] or headquarters [email protected]. Of course, you can talk with me, the executive staff, and Councilors face-to-face at our upcoming Annual Meeting in St. Louis, Missouri, this August, if you are there. Now, I pay you compliments! The FCC is looking at the possibility of using the 3.7–4.2 GHz band, currently used for NOAAPort transmissions, for a broader range of services including wireless broadband. Receive-only Fixed-satellite Service (FSS) and Fixed Service (FS) sites are not required to register with the FCC. For this reason, it is unknown how many existing sites are receiving data using this frequency. Without this information, it is difficult to assess the impacts of expanding services in the 3.7–4.2 GHz frequency band. To understand the current landscape, the International Bureau opened a 90-day filing window for applications to license or register existing earth stations in the 3.7–4.2 GHz band. Stations that were constructed and operational as of April 19, 2018, may file. 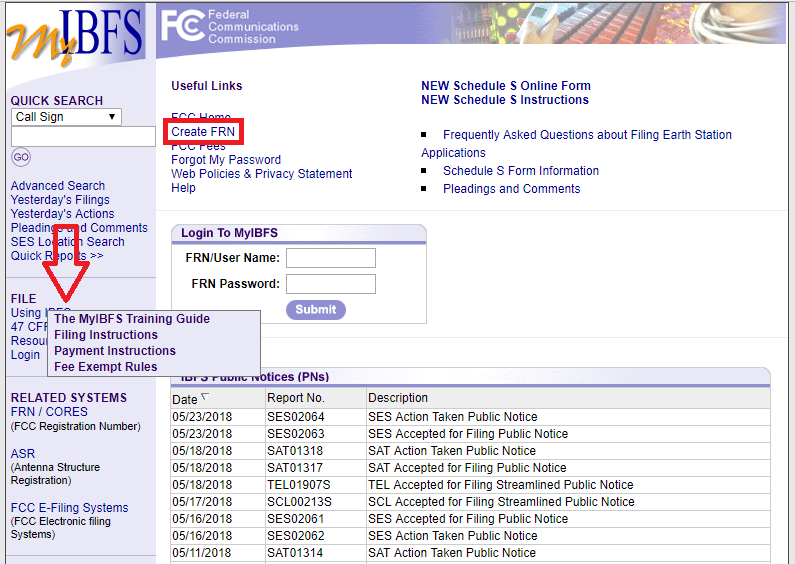 The filing window closes on July 18, 2018. Applicants must file electronically through IBFS on FCC Form 312 Main Form and Form 312 Schedule B, remit the statutory application filing fee, and provide any additional information required by applicable rules. See the last few paragraphs of the notice (linked below) for details. Using IBFS link under FILE contains site instructions. The red box indicates the link to create the FRN. The Bureau also placed a temporary freeze on applications for new or modified FSS earth stations and fixed microwave stations in this band. For our NWS members, please note that the NWS is in the process of registering their antennas. More information is contained in the FCC Public Notice DA-18-398. Congratulations to NWA member Tim Schmit for being selected as a Samuel J. Heyman Service to America Medals finalist! This award recognizes federal employees for their outstanding service and inspiring accomplishments. Member Jordan Gerth informed us that Tim was nominated for his role in working with GOES-R. The Sammies are known as the “Oscars” for government service. An award winner is selected for each of seven categories by the Sammies selection committee, and the People’s Choice Award winner is chosen by the public, which means all of us. 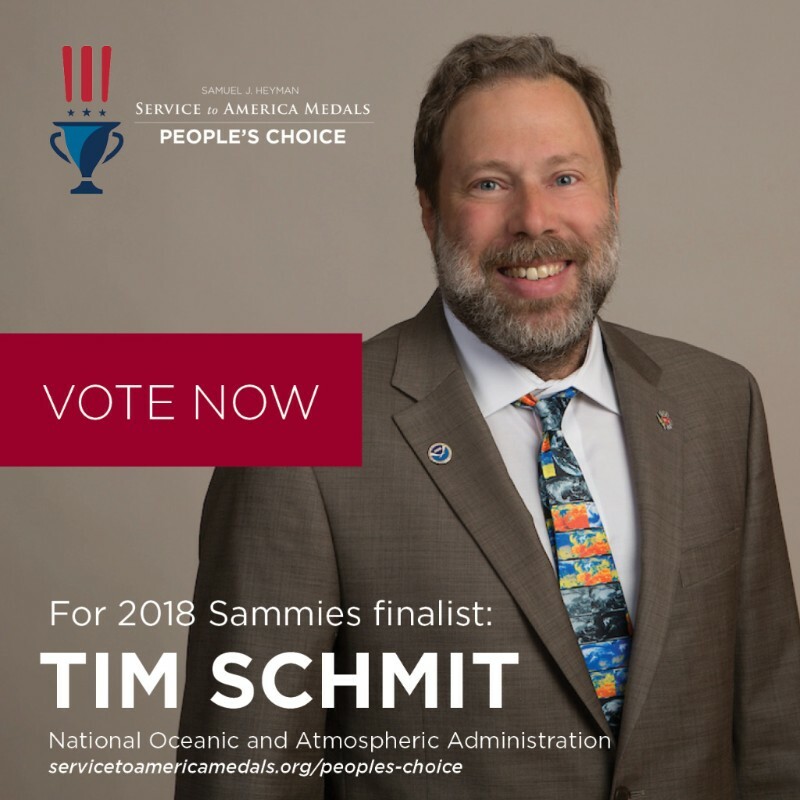 Tim's colleagues would like to make sure everyone in the weather enterprise is aware of the open voting for the People’s Choice Award and encourage you to vote early and often (you can vote more than once). The first round of voting ends at 11:59 p.m. EDT on May 13, and the top 12 vote-getters will be announced on June 1. The second round ends on June 20 with the top 4 being announced on June 21. All voting ends on July 9 and the People's Choice Award winner will be announced on July 19. Let's get the vote out for Tim! Tim was the 2011 NWA Dr. T Theodore Fujita Research Achievement Award winner. His accomplishments with the GOES-R program are many. Read why Tim is a Sammies finalist. As part of the NWS Hazard Simplification (Haz Simp) project, the NWS recently reduced the number of winter weather product types that are issued. This was done by consolidating winter advisory products to one Winter Weather Advisory and winter watch products to one Winter Storm Watch. The NWS also simplified product text to three main bullets of information: What, Where, and When. Following this successful transition, the Haz Simp team will continue to engage users about further consolidation and reformatting. Currently, NWS is conducting a survey on a series of changes to the visibility, temperature and wind products. The survey is open from May 15 to June 15, 2018. Be on the lookout for two more surveys to be released in June or July that will focus on 1) consolidation of Winter Warning products and 2) consolidation of Flood Watch, Warning, and Advisory products. The NWS thanks you in advance for your feedback and engagement on these important topics. Steve Drillette, Meteorologist in Charge (MIC) of the Weather Forecast Office in Little Rock, Arkansas, passed away in April after a courageous three-year battle with cancer. Steve was a longtime member of the NWA, and was definitely a lifelong Texas A&M Aggie. Steve taught and coached basketball for the first eight years of his career before being hired by the National Weather Service. He stayed with the NWS for the next 25 years, and worked at offices in Texas including Amarillo, Lubbock, Midland, and Brownsville. In April 2015, he came to Arkansas as the MIC. With a soft touch and a positive demeanor, he led the office while battling cancer much of the time. His focus was outreach—to get out there and shake hands with the community. It was important for him to let the world know that we were here to help. As he struggled with his disease, his vision never wavered and he never complained. His faith and love of weather, family, and staff carried him through. 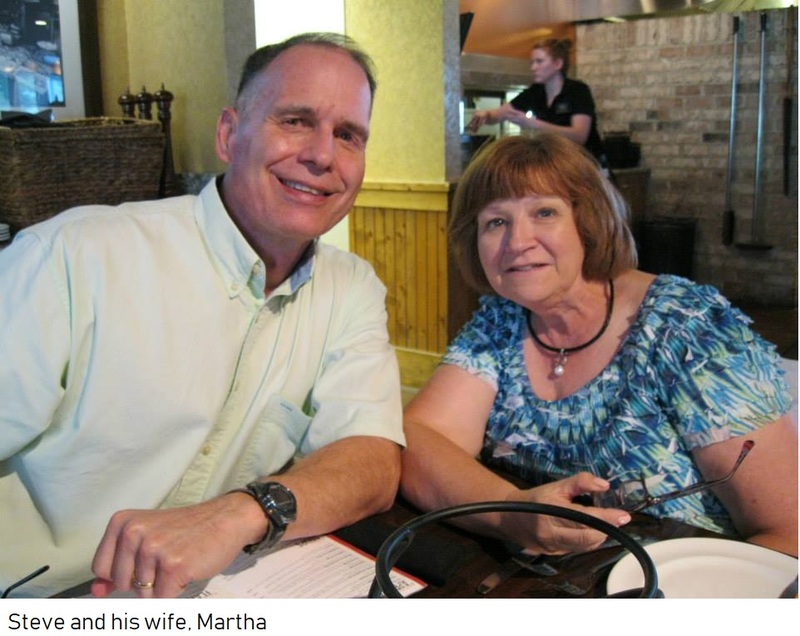 Steve was known for his selfless nature and love for family, friends, employees, and practically everyone he met during his short 57 years of life. As Steve was battling cancer, he was awarded the NWS Isaac Cline Award for Leadership, nominated by the staff of WFO Little Rock. He was a member of Immaculate Conception Catholic Church, North Little Rock Rotary, a CASA (court-appointed special advocate) volunteer, and his 3.0 senior tennis team won the Arkansas state title in 2017. Three articles have been published in the NWA’s JOM since the beginning of the year. JOM 2018-1 (Article): Relationship of low-level instability and tornado damage rating based on observed soundings, by Nicholas L. Hampshire, Richard M. Mosier, Ted M. Ryan, and Dennis E. Cavanaugh. JOM 2018-2 (Article): A Preliminary look at using rainfall average recurrence interval to characterize flash flood events for real-time warning forecasting, by W. Scott Lincoln and Rachelle F. L. Thomason. JOM 2018-3 (Article): Exploring the human side of meteorology: A brief report on the psychology of meteorologists, by Matthew J. Bolton, Lara K. Ault, David M. Greenberg, and Simon Baron-Cohen. The JOM publishes submissions in four categories: Article, Short Contribution, Images of Note and Commentary. The JOM is a peer-reviewed, all-electronic journal with an international scope, providing authors with the benefits of economical publication costs and rapid publication following acceptance. If you are interested in submitting a paper to the JOM, please go to the website for author information. Thank you to the JOM authors, reviewers and editors for continuing to make JOM a success! 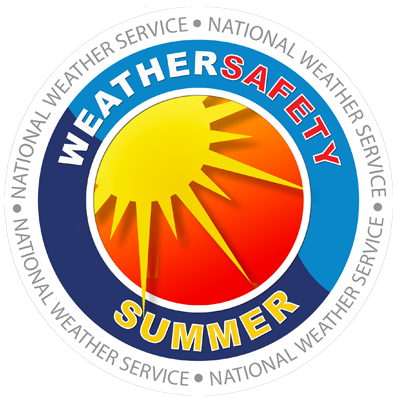 The Weather Ready Nation Summer Safety campaign begins on June 1. Severe summer weather, such as tornadoes and extreme heat, causes numerous injuries and deaths and billions of dollars in damage. 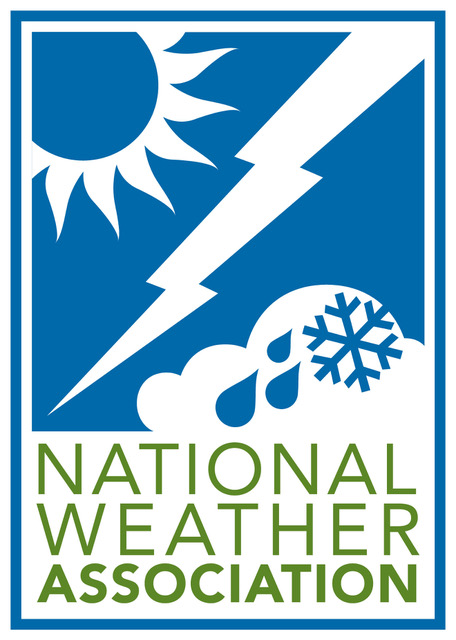 The WRN Summer Safety web page has learning resources for all the summer weather hazards including floods, heat, hurricanes, lightning, rip currents, and tornadoes. These resources provide information that is vital to keeping you and your loved ones safe. Materials for the summer campaign can be found by clicking the infographics on the page. Feel free to share the content—the NWS WRN encourages it! The National Weather Association Foundation will be hosting its Third Annual WeatherReady Fest on Saturday, August 25, 2018, in St. Louis with the help of many volunteers from the NWA. That’s where you come in. Even if you aren’t coming to St. Louis, consider volunteering to work on a WeatherReady Fest planning and execution team. There are slots to help with logistics, promotion and programming. You can help identify and recruit speakers and exhibitors, suggest and organize fun educational activities, and help us gather door prizes from your network. If you are coming to St. Louis, don’t miss this opportunity to give back by volunteering at WeatherReady Fest. You will get a beautiful commemorative Polo-style shirt and the chance to help communicate weather safety and preparedness to the public. It’s not too late to secure last minute sponsorships. 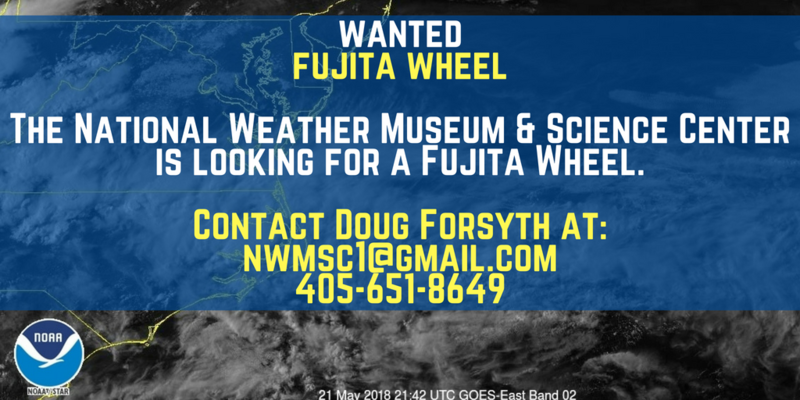 If you know of an organization that would like to support our mission of weather education, point us to them! 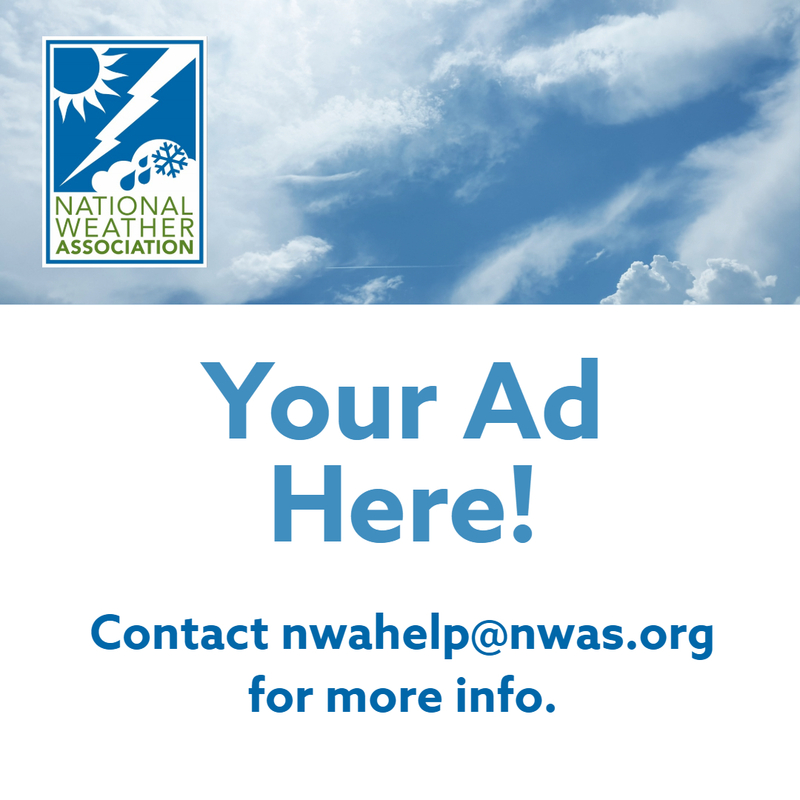 WeatherReady Fest keeps growing and growing, thanks to the efforts of dedicated NWA members like you! You will get a tremendous amount of satisfaction from being a part of it. Check out the WeatherReady Fest website for more information, and contact Bill Murray if you are interested in helping in any way.